Issuing Company: The Times (Confectionary) Co. Ltd.
Notes: Checklist not presented here, since all cards feature Roy Rogers and other actors in scenes from the movie "In Old Amarillo." 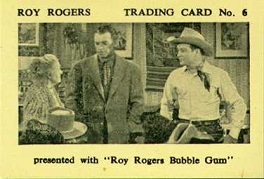 An album was issued that was intended to be used with this set and the other Times Roy Rogers set. Thanks to Ron Strader for providing album scans.